1. Brush out your hair so it’s smooth, then divide it into two equal sections. 2. Take an outer strip from one side and cross it to the inner part of the opposite side. 3. Now take an outer strip from the second side and cross it over the the inner part of the first side. 4. Continue crossing outer strips to the opposite side until you reach the end, then secure with an elastic. 5. 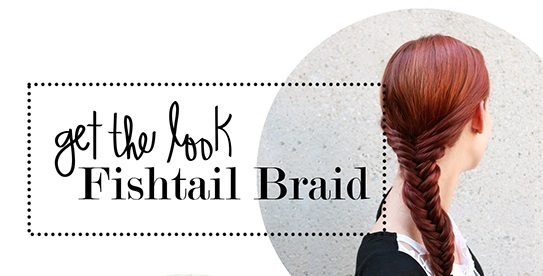 Voila – You’ve created a fishtail braid! Love this model’s hair color? She’s rocking Light Brown Auburn from online hair color retailer eSalon.com. And if you have color-envy, they can help you get your own stylish shade at home! eSalon’s color experts will review your photo and hair details to create your very own, individually blended color, just like in a salon. It’s so personalized, your name is on the bottle, because it’s made for you and no one else! They even mail it right to your doorstep to apply at home, and the color is under $20. First time clients can get a their custom color kit for only $10 (a 50% savings!) with a satisfaction guarantee. Go to eSalon.com to get started.